Lodge Gomantak No.248 celebrated Universal Brotherhood Day on 24th June, 2016 at the Goa Branch of Shanti Avedna, a Hospice for terminally ill cancer patients. Brethren of the Lodge, along with their families, interacted with the matron, sisters and voluntary workers running the hospice and the patients at the facility. Hospital supplies and toiletries, etc. were presented to the Sister in charge of the hospice. Snacks and soft drinks were served the inmates. The total value of the charity was about Rs. 16,000/-. Ms. Maria Rodrigues, the young and dynamic Sarpanch of Loutulim Village Panchayat, on the invitation by the brethren, graced the occasion, and her graceful presence was appreciated by all. Readers may recall that the Masonic Temple of Lodge Gomantak will be constructed on the plot of land situated in this village. As the W. Master of Lodge Gomanatk No. 248 was away on a pressing family engagement, W. Bro. Devidas Borkar, W. Master of Mark Lodge Gomantak No. 153 addressed the gathering. He gave an overview of the nature of Freemasonry and the importance of Universal Brotherhood Day. Brethren lauded the good work being done by the sisters who managed the hospice and requested the matron in charge to contact the brethren for any further assistance needed from the Lodge. The Sister in charge complimented and thanked the brethren of Lodge Gomantak for visiting and bringing solace to the inmates of the Hospice for many years in succession. After the visit to Shanti Avedna, members of Lodge visited the site of the proposed Masonic Temple at Loutulim. A get-together and fellowship was also organized as a part of the celebration of Universal Brotherhood Day. W. Bro. Anastasio Colaco treated the brethren to a sumptuous dinner at his residence. All the brethren enjoyed the fellowship and dinner. The 35th Annual Installation Ceremony of Lodge Gomantak No. 248 was held on Saturday, 20th February, 2016 at Jai Kieran Hall, Ramnathi, Goa. Bro. Manoj Timble was ceremoniously placed in the Chair of King Solomon by W. Bro. John Sylvester Silveira, the Ruling Master of the Lodge. W. Bro. Manoj Timble then appointed and invested his Officers for the year 2016-17. The ceremony was attended by brethren of the Lodge in large numbers. W. Bro. C. Nagaraju, ARGM of North Karnataka and Goa Area graced the occasion as representative of the R.W. the Regional Grand Master of the Regional Grand Lodge of Southern India, R. W. Bro. Arvind Prasad Chitra. W. Bro. Nagaraju congratulated the outgoing Master on his achievements in the year 2015-16 and wished the incoming Master well. He complimented the officers of the Lodge, particularly the Secretary and the Treasurer, for their outstanding performance. He also delivered the Address to the Master. W. Bro. John Sylvester Silveira gave a succinct report of his Stewardship of the Lodge highlighting the various activities of the Lodge. He appreciated the co-operation he received from both senior and younger brethren of the Lodge. He thanked the officers of the Grand Lodge of India and the Regional Grand Lodge of Southern India, and especially R. W. the Regional Grand Master R. W. Bro. Arvind Prasad Chitra and W. the ARGM W. Bro. Nagaraju for their, advice, support and encouragement. W. Bro. Mohan Annigeri, Ruling Master of Lodge Dharwad No. 54, W. Bro. Bharat Mudareddi of the same Lodge, and W. Bro. M. Ganganna of Lodge Vijayanagar, Hospet graced the ceremony with their presence. The august presence of W. Bro. Richard J. Kendrick PPSGD (Past Provincial Senior Grand Steward), UGLE (who incidentally celebrated his 41st Masonic Birthday on 20th February) brought greater colour to the ceremony. The evening ended with toasts, a raffle in aid of charity, a festive board, fellowship and a karaoke session which were enjoyed by all. Brethren of Lodge Gomantak No. 248 met the representatives of the Daddy’s Home for the Elderly at the festive board after the Lodge meeting on 21st November 2015, who spoke about their new project for which they were collecting funds. W. Bro. 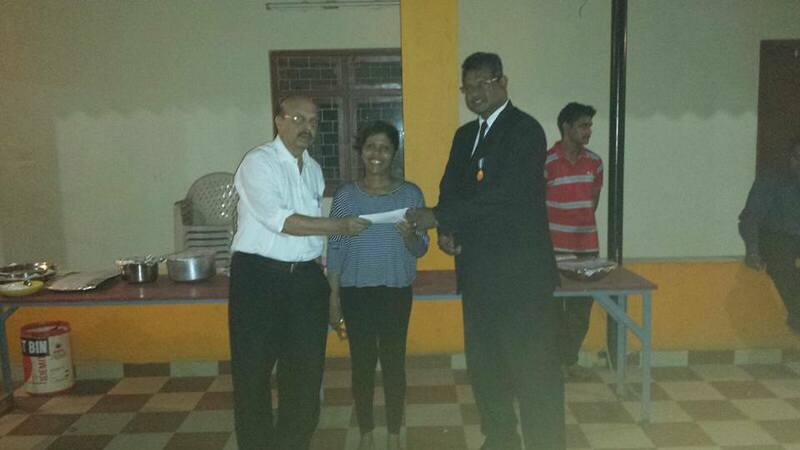 John Silveira, W. Master of the Lodge, presented them with a cheque for 5,000/- on behalf of the Lodge. Most of the Brethren also bought tickets at Rs. 300/- per person for the Zumbathon organized by them at a later date, the purpose of which was to raise funds for the home. Lodge Gomantak No.248 celebrated Universal Brotherhood Day on 24th June, 2015 at the Goa Branch of Shanti Avedna, a Hospice for terminally ill cancer patients. Brethren of the Lodge, along with their families, interacted with the sisters and voluntary workers running the hospice and the patients at the facility. Hospital supplies and toiletries, etc. were presented to the Sister in charge of the hospice. The W. Master, W. Bro. John Silveira served the inmates snacks and soft drinks. The total value of the charity was about Rs. 11,500/-. The Sister in charge complimented and thanked the brethren of Lodge Gomantak for visiting and bringing solace to the inmates of the Hospice for three years in succession. After the visit to Shanti Avedna, members of Lodge and their families visited the site of the proposed Masonic Temple at Loutulim. A family get-together was also organized as a part of the celebration of Universal Brotherhood Day. All the brethren and their families enjoyed the fellowship and dinner. The newly formed Mark Lodge Gomantak No 153 was ceremoniously consecrated and constituted at Highland Beach resort, Candolim, Goa on Saturday, 6th June 2015 at 9.30 A.M. in a very solemn and impressive ceremony. Twenty-six brethren from Goa, Belgaum, Hubli and Dharwad had petitioned to the Grand Lodge of Mark Masons of India for starting a Mark Lodge in Goa, and the petition was acceded to by the M. W. The Grand Mark Master. 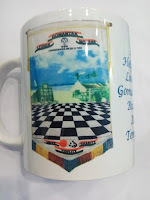 Accordingly, it was decided to have the consecration of the lodge on the occasion of the Especial Communication of the Grand Lodge of India to be held in Goa on 6th June 2015. M.W. Bro. Vasudev Jamnavihar Masurekar, M.W. the Grand Master of the Grand Lodge of Master Masons of India was the Consecrating Officer and was ably assisted by R. W. Bro. Arvind Prasad Chitra as I.P.M. and Installing Officer, R.W. Bro. S. K. Chibber as S.W., R.W. Bro. V. Kesava Rao as J.W, V. W. Bro. Subhash Chawla as Chaplain and V. W. Bro. R. Rajeev Raj as D.O.C. and R. W. Bro. V. K. Gupta as Secretary. First a Casual Lodge of Mark Master Masons was opened and then Mark Lodge Gomantak No. 153 was ceremoniously consecrated and constituted according to ancient custom in a very impressive manner by the Consecrating Officer. V. W. Bro. Subhhash Chawla gave the oration. W. Bro. Madhukar Chatrabhuj Thakkar was then ceremoniously installed as the Founder Master by R.W. Bro. Arvind Prasad Chitra, R. W. the Regional Grand Mark Master of the Regional Grand Mark Lodge of Southern India. Bro. Subhash Malkarneker was elected Founder Treasurer and W. Bro. Suhas Ganachary Tyler of the Lodge. Steward Bro. Gururaj D. Naik. Address to the W. Master was given by R. W. Bro. A. P. Chitra, to the Wardens by R. W. Bro. S. K. Chibber, to the Overseers By R. W. S. Thirugnanamurthy and to the brethren by R. W. Bro. V. Kesava Rao. The Founder W. Master W. Bro. M. C. Thakkar, R.W. Bro. A. P. Chitra, R. W. The Regional Grand Master and M. W. Bro. V. J. Masurekar, M.W. the Grand Master then addressed the brethren. M. W. Bro. Vasudev J. Masurekar, M.W. the Grand Master of the Grand Lodge of Mark Masters of India and R.W. Bro. A. P. Chitra, R. W. The Regional Grand Mark Master of the Regional Grand Mark Lodge of Southern India were elected Honorary Members of Mark Lodge Gomanatak No. 153. Founder members attending the ceremony were presented with Founder Member Jewels. The consecration ceremony was attended by Masons from all over the country, including two past RGM's, all the four ruling RGM'S, the Grand Master elect and the Grand Master. All the Petitioners felt proud at the unique distinction of having, probably for the first time, all the RGM's, the Grand Master elect and the Grand Master present for the consecration of any Lodge in India.